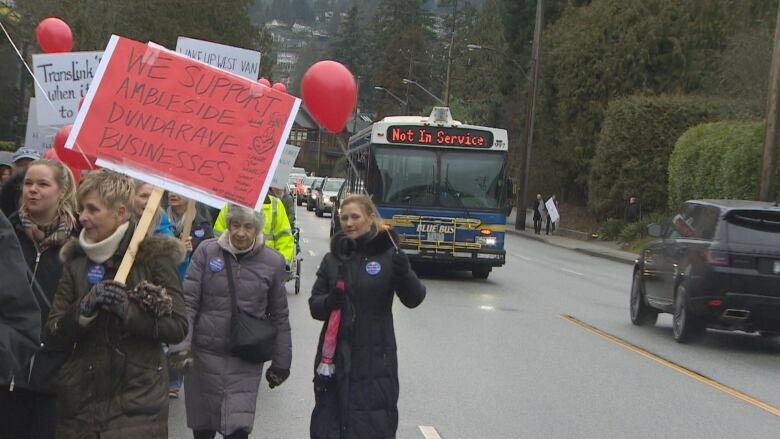 The proposed creation of an express bus lane in West Vancouver brought residents on both sides of the issue out onto the streets for duelling protests on Saturday. West Vancouver councillors have voted down part of the plan for a longer rapid bus line through the city to North Vancouver, effectively sending the project back to the drawing board. The proposed Marine-Main B-Line bus route would run along Marine Drive between Dundarave in West Vancouver and Phibbs Exchange in North Vancouver. 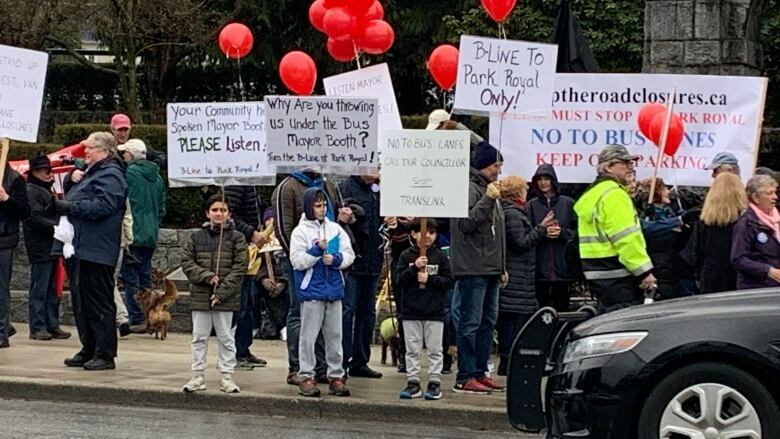 West Vancouver councillors voted in favour of stopping the line short at Park Royal Shopping Centre, close to the municipal border with North Vancouver — much to the elation to protesters who've rallied against the line for months. Mayor Mary-Ann Booth said the vote is like a reset to calm the debate, especially "the attacks and intimidation and criticism of other residents, including young people" who were in favour of the project. The plan for the line will still move ahead in light of Monday's vote, but will need an overhaul as it can no longer rely on bus-only lanes. The proposed Marine-Main line is one of four new B-Line routes Translink plans to build this year as part of its 10-year-vision plan. The B-Line bus routes are designed to be faster and more reliable by combining stops that are at least one kilometre apart. Under the plan, some parking will be removed and a lane of traffic in each direction on Marine Drive will be converted to a bus-priority lane that drivers can only use when turning right or when parking. Opponents complained the bus lane would add to congestion and negatively affect businesses in the area. 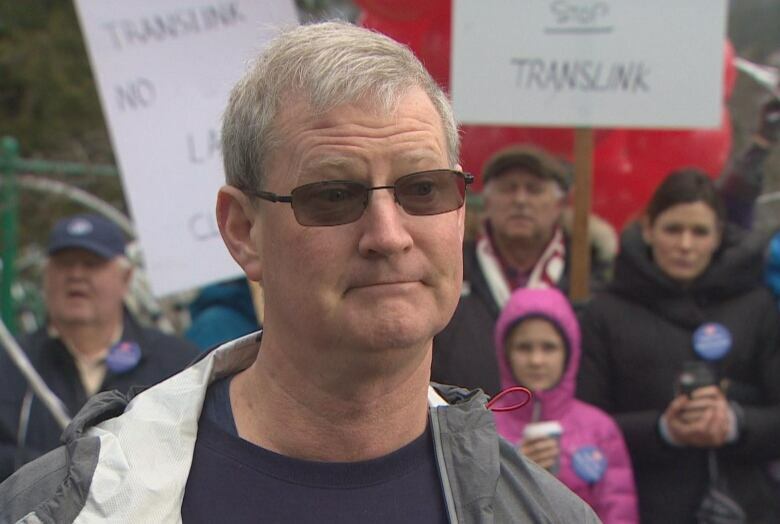 "People of West Vancouver do not want their roads closed, they do not want parking taken away from the business district, and the children do not want articulated buses running past their school," Nigel Malkin, who organized a rally against the project last month. Supporters said the new line would improve commute times and possibly get more people out of their cars. "Transit is the inevitable future of our communities … 25 parking spots cannot stand in the way of that," said Graham Garnett at an opposing rally. "The people on this protest are completely out of touch with the actual people who live and commute to West Van." West Vancouver city council will examine a new report for alternative options in 30 days — and try again.